The geological engineers confirmed you have sinkhole related damage and provided you with a list of sinkhole repair companies in your area. Where do you go from there? How do you choose the right contractor for this major, unexpected problem? 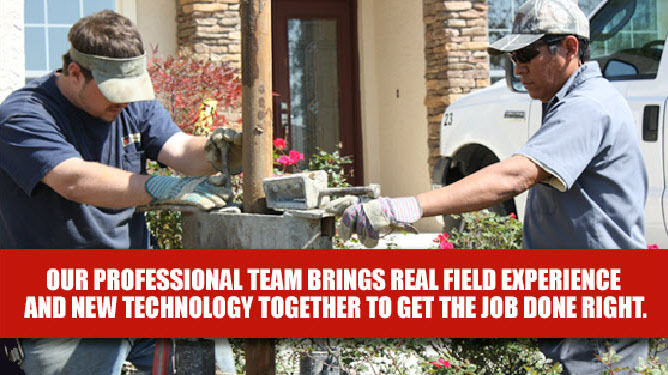 Or for any foundation repair, new foundation construction or soil stabilization project? Making such an important decision affecting your property can be daunting. Especially if you never knew much about sinkholes, the stability of Florida soils, foundation damage, repair options, insurance issues or anything else related to these problems. Who can you trust? You know you want a company team with experience, a history of innovation and skill in this specialized area, with good customer service to carry you through this and relieve your anxiety. You want someone who will tell you it will be all right, then handle everything for you and actually deliver on their promises, when they promised it. So how do you determine which of the recommended contractors will do it best? Get a little background on the issues by checking our Resources page and FAQs, then prepare a list of questions you want to ask each company. Here are a dozen questions to consider. Don’t take this for granted, because Florida has many unlicensed, unqualified contractors. Many of them will jump into this work when construction is weak, but only end up causing you a nightmarish experience, huge expenses and further damage (and give the sinkhole repair industry a bad name). Ask if the company is “state certified” to ensure they meet the minimum requirements established by the state, such as being properly bonded and insured and not reported for bad business practices. Make sure the company is licensed to work in your county, too. Double check. Confirm that the contractor is licensed by going to the Florida Department of Professional Regulation. Does the contractor display license information on its website, company literature, business cards? Are You A Better Business Bureau Member? Check the BBB in the area of the contractor’s headquarters and your own county. What is their rating? You don’t have to settle for less than a sterling “A+” … and do check the Complaints files at the BBB.org. Are you a full member of FAS3? FAS3 provides the most up-to-date information about sinkholes, sinkhole remediation and technical innovations for engineers, geologists and contractors. How many years of experience do the owners and company have in sinkhole remediation and foundation repair? We’re not talking about your usual construction companies who might also be doing post-sinkhole cosmetic restoration now. You want a company for whom this technologically demanding specialty has been a primary focus for a long period of time. You want the company’s owners to be hands-on, experienced specialists in the business who bring significant knowledge, soundness and innovation to the equation…experience you can trust. What’s the experience level, training and trustworthiness of the technicians who will be working on this project? You want a team that has stringent hiring policies, conducts thorough background checks, and insists on on-going training. You want to see references from satisfied customers who speak directly to the issue of the workers on their property. You want to know about the experience level of the foreman who will be assigned to your job and the General Manager over him. You also want to know that all workers will be wearing company uniforms, so you can know they are legitimate when they work on your property. Will there be any subcontractors on your property at any time during the project? What procedures do you recommend for my situation? Why? What’s the cost, what’s the warranty, and what variables should I be concerned with? You need to know the repair method that will be used. If there are options, you want to know the pros and cons and anticipated results, as well costs. You want to know what your insurance covers, and if there’s financing available. You want a full explanation of the warranty. Observe the sales personnel carefully. You want to be sure you’re not being “sold” but educated. How willingly did they answer your questions? Did they engender confidence and trust and exhibit thorough knowledge of the subject? What disruptions should be expected during the repair process? What kind of disruptions and damage to your property can you expect during the course of the project? What will be done to lessen the impact on your property? Will the workers leave your property as clean as possible before leaving for the day? Will traffic on your street be impacted? How do you handle unexpected situations? Ask the difficult questions, such as how they would handle unexpected events, such as damage to your property? Since there are many uncertainties at the commencement of this kind of project, how do they handle any unexpected costs? What products, tools and equipment will you be using? You want a contractor who uses technologically advanced tools, equipment and procedures, has a good maintenance program, and who uses only the best products. You want to understand generally how these tools, equipment and products will be used on your project and what you can expect both during the project and after completion. Ask for customer testimonials and case studies, then ask to speak to some of the former customers. Ask if there is a current job that’s not too far away, ask if you can walk through a current job site with the foreman. Can your divisions and subsidiaries complete the entire repair process, including restoring the cosmetics of my structures and surrounding area? Many sinkhole repair companies handle just one aspect of the business, leaving you with the time-consuming, frustrating, inefficient and costly process of coordinating different contractors to restore your property fully. But you want to deal with ONE person who will coordinate it all for you, to relieve some of the great stress, and to ensure everything is done efficiently and on schedule. You need a company that has expert teams (divisions or subsidiaries) who can do everything you need, start to finish. That means they can not only deliver a sound foundation on stable soil, but finish the job for you with structural and cosmetic restoration, even hardscape repair and landscaping, so your property is left better than before! See how powerful the reasons are. Does the salesperson seem to really believe the words? Ask questions such as: “What sets you apart? Why do you believe you are better for my project? How do I know I can trust your company to do the best job, at a fair price, on time, and to protect my security and environment in the process?” You could be surprised at the insights. We want to help you back on solid ground. © Foundation Services of Central Florida, Inc.
Foundation Services of Central Florida, Inc.